A polygon is a plane figure bounded by 3 or more straight lines. A plane figure is a flat figure. (2D shape). This means it has a height and a length but no thickness. You have already covered polygons with three and four sides. these are called triangles and quadrilaterals respectively. In this section we will only briefly recap these shapes. We will be more concerned about shapes with 5 or more sides. A regular polygon is a polygon with all sides of equal length and all angles of equal measure. 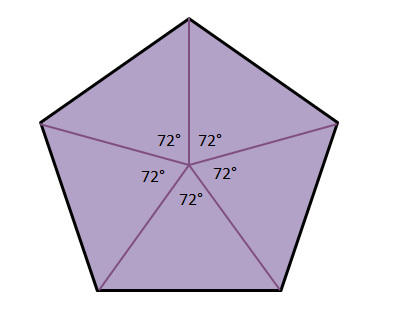 An irregular polygons have sides of differing length and angles of differing measure. In this section we will go into an in-depth look at polygons and answer a few question at the end. 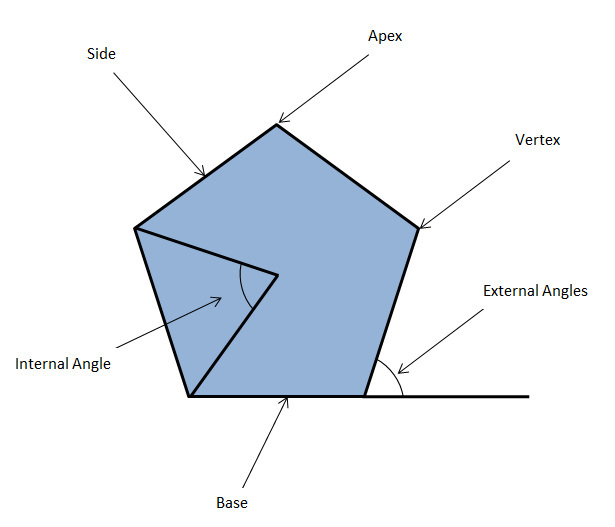 Parts of a Polygon - In this section we will go through the parts of any polygon type in detail. Types of Polygons - In this section we will go through the difference between regular and irregular polygons. We will also go through the properties of all the popular regular polygons. At this stage we have covered all the basic information we need to construct various Polygons so if you are confident on all the information covered up until this stage it is time to attempt a few questions. These questions will also incorporate information we learned in all the previous sections of this website.